The moment of truth is finally here. 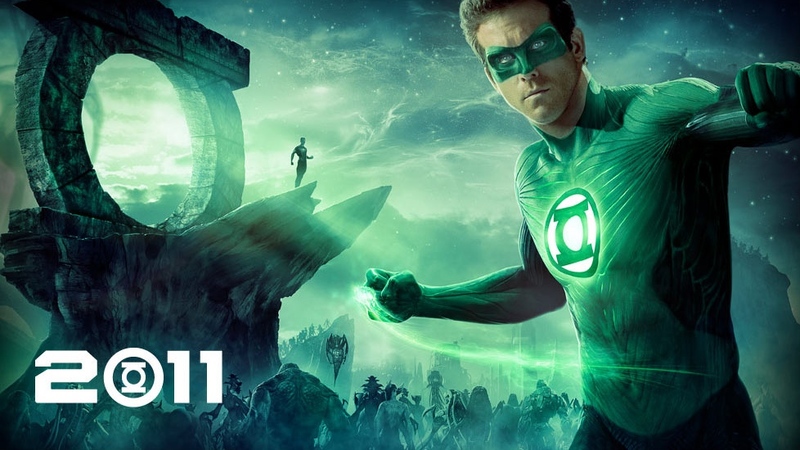 Green Lantern makes its way onto the big screen, something I never thought I would see. For those of you that are new to the site, Green Lantern ranked number one on my most anticipated Summer movies. What'd I think?...well its frustrating and a whole lot of fun at the same time. I am a movie freak, and like you( I think?) I peruse movie websites frequently. So when the reviews started pouring in screaming to the high heavens that this was an abysmal failure, and the a signal that the apocalypse was indeed still approaching in October I was taken aback. I take most reviews with a grain of salt, but the consistent negativity worried me. So going in I wasn't sure what to expect, visually the trailers looked amazing....but everyone was positive this was the worst movie of the year. I think all of that is just ridiculous. I'm a relatively positive guy so I get it, but everyone should be able to recognize what this film gets right as well as what it gets wrong. The amount of hatred for this movie is really without grounds in my opinion....that's not to say it lived up to my expectations. I have been looking forward to this movie for a long time, and in my last Nerdlert I talked about a few of my fears for the movie, and I'd have to say a lot of them are true. I mentioned that the film would suffer from being too expository and fall into traditional faults of "origin" movies, and this one definitely does. The whole film seems rushed, like the filmmakers knew they had to get through this one in order to get to the good stuff. Yeah I get it not a lot of people know about Green Lantern like they do Bats and Mr. Kent, and Campbell and crew spend a lot of time trying to set up this universe jumping from introduction to introduction making sure they give you a broad sweep over the Corps, the villains, the history, what a Green Lantern is, and Hal's life on earth thus far. It's a lot to get into a short film, X-men clocked in at over two hours, this film is about one hour forty-five. Campbell easily could've used the extra fifteen minutes to make some of the plot turns make more sense. Since he is trying to shove everything into a short time frame, events begin to just happen in order to get our characters from point a to point b, and editing takes a beating. Scenes seem chopped together moving swiftly from training, to self doubt, to suiting up again, to falling back in love with Carol Ferris to this and that, all with the intelligence of someone who just took a screenwriting 101 course. Campbell never lets you sit with the characters and really absorb what's going on, the tortured self doubting hero routine is fine(if a bit overdone) but Hal changes his mind and suits up again within minutes. What else? Well I mentioned the script, and boy does it show that the writers were television writers. The dialogue is passable, but they just can't help themselves and bits of self aware douchiness seep in whether its the absurd "I KNOW RiGHT!!!!" when Hal shows off his costume, or his friend asking if Abin Sur asked him to marry him when Hal showed him the ring he was given. Again the writers just move from scene to scene with little motivation other than "hero must save party", Hero must stop Hector, Hal needs to overcome fear etc etc etc. It gets tedious and make what actually does work really well(don't worry I'll get to the positives in a minute) seem almost meaningless at times. 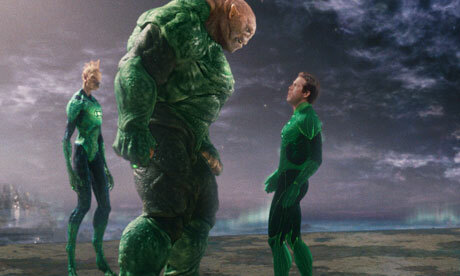 The best instance of this is the training sequence with Kilowog. PERFECTLY realized Kilowog....him training Jordan was about as perfect as you could ask for...except it lasts five minutes....and then Hal leaves and when he puts the ring on again he is a master at it. Lastly, Blake Lively as Carol...failure. Alright I said at the beginning that the hatred for this movie was without grounds. So look there's stuff that doesn't work(see above) but if you don't realize that there's a good movie in there, and that they are now in a position to give you the Lantern movie we all want then you're crazy. EVERYTHING in space works. From the opening sequence with Abin Sur(Temuera Morrison does a fine job and unlike everything else his role was supposed to be short), to the GLORIOUSLY beautiful Oa. This is when the movie is at its best. The energy flows off screen and you can feel how much fun this series can be, and you can tell that this is where the filmmakers put the most effort. Oa is a gorgeous planet full of unique lanterns from across the universe. Fans can find their favorite member of the corps in those wide shots cause they're all there. Tomar-re is brilliant and his exposition at least feels didactic rather than the repetitive "I must overcome fear" speeches that characters give Hal on earth. Kilowog is great, the voice.....the power when he moves....awesome all of it. The guardians? perfectly emotionless loved it. Then there's Sinestro. I would have killed for this to be more in the vein of the animated First Flight that had Sinestro take Hal on his first mission as his protege. 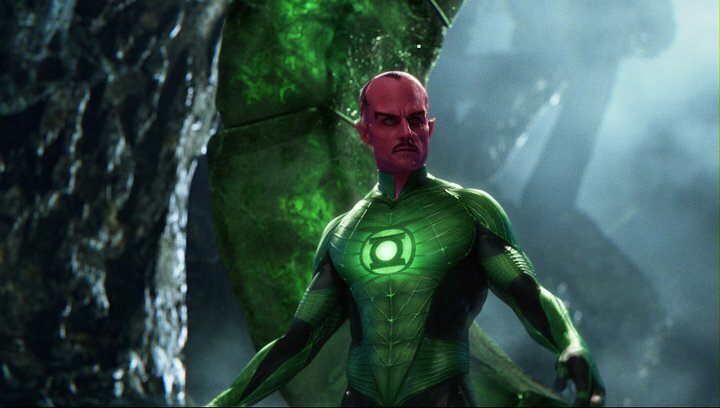 Mark Strong IS Sinestro. He's given very little to do but he makes the most of it. Perhaps the biggest disappointment is not seeing just ow amazing of a lantern Sinestro is, but even without that Strong lends the right amount of presence and elitism to the role. Saarsgard as Hammond is delightfully demented. I was wondering how far they would let him take this role, and boy they let him go all out. Constantly in agony and tired of living under the thumb of his father Hammond here takes crazy to new levels. He almost single handedly takes this film out of kiddie territory thanks to the absurd amount of agony he brings to his character. Alright ...Reynolds....owns the role. He is a great Hal Jordan. He tones the humor just enough(but it is Reynolds and the charm is still there) and replaces it with heroism. The scene where Abin Sur crashes and Hal sees the ship is my favorite "Hal Jordan" moment. He immediately runs to the rescue, only later realizing that he just found a spaceship and saved an alien. That is beat for beat Hal Jordan. Jordan is rash and reckless but always heroic, he is always ready to run in to save anyone he can without thinking first. 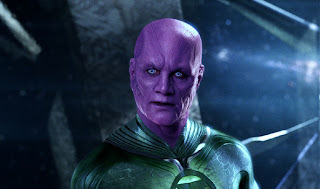 His chemistry with Carol Ferris is horrible...but I'm going to blame Blake Lively for that. Once he finally accepts his role as a Lantern, seeing Reynolds take Hal Jordan into combat is bliss. The showdown with Parallax(who as an effect is actually kinda cool..still a big CGI blob though) was much more entertaining than I thought it would be. Seeing Hal create constructs expertly and creatively, love the catapult, was a great moment. I really hope they let this series live for at least one more installment, so we can see a whole film of Reynolds as Green Lantern proper, cause he deserves it. In the end it is an inconsistent origin film. Some decent script and editing problems as a result of the desire to set up this universe as quickly as possible really take away from how much this movie gets right. You get a sense that all those great moments are never earned. They live as "cool" scenes but don't have the emotional backbone that would elevate this film to greatness. It's sad that the filmmakers felt they had to go this route and give us a paint by numbers origin film, but now that it's out of the way hopefully we will get an amazing second film. X2 improved upon X1 exponentially, same with Spider Man....This film isn't Wolverine, or X3, but it sadly isn't the great Green Lantern film I wanted it to be. Don't get me wrong I had a lot of fun, but my mind hole was definitely not blown, and sometimes mediocrity is the worst disappointment of them all. One last thought - post credits scene was cool from a fanboy perspective....but even then I don't think they earned that moment.